Dew point and condensation are uncommon terms often associated with roofing. Not a lot of people know how these can affect the roof in terms of weather tolerance and long-term serviceability. Our roofing experts at Signature Exteriors discuss how these two can affect your roof. There’s always water vapor in the air, but when it comes in contact with a cold surface, the water vapor condenses into a liquid on the surface. This phenomenon is condensation and also occurs when there’s a sudden drop of temperature. Condensation on the roof is a common occurrence on “cool roofs,” such as asphalt, metal and single ply membranes for flat roofs. The dew point refers to a specific temperature at a given level of humidity at which water vapor condenses and turns into liquid. In layman’s terms, it’s essentially the amount of water vapor in the air, taking into account the temperature of the air, as well. The higher the dew point, the more likely your roofing system will experience condensation. Dew point ranges from area to area; for Connecticut, the dew point is fairly high. For Norwalk, the dew point is 60 °F with humidity at 54%. Westchester has a higher dew point at 61 °F but with a lower humidity at 36%. Too much condensation can be bad for your roof, especially if the structure has existing damage, or if it’s older. Since water vapor turns into liquid once it touches the roof, the structure is essentially sustaining water damage when humidity is high. This can be very problematic if condensation forms in the more vulnerable parts of the roofing system, such as the valleys, soffit and fascia. 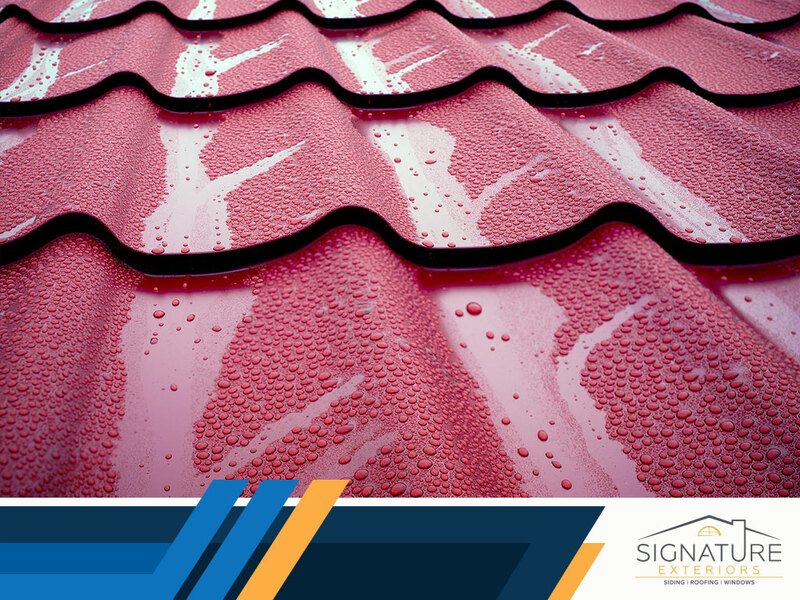 Roof condensation is tricky to address, but Signature Exteriors is ready to help you with it. We’ll help you set up an effective preventive maintenance plan that will protect your home from extreme roof condensation. Call us today at (866) 244-8029 to learn more about our services. We are roofing contractors serving homeowners throughout Norwalk, Westchester and Connecticut.